The residents of the Capitol in The Hunger Games are brash, outlandish… and completely high fashion. Want to capture people’s attention? 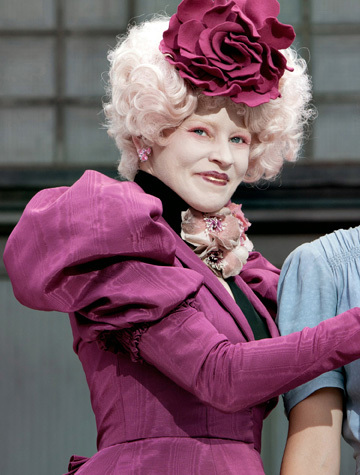 Find out how to dress like Effie Trinket and the rest of the Capitol creatures. The Hunger Games author Suzanne Collins created her Capitol characters as vain characters who love to adorn their bodies with everything from fake lashes to body enhancements. One of the craziest parts of the Capitol look is the hair! Effie Trinket and the rest of the female Capitol citizens have hair and hairstyles that would make the bride of Frankenstein proud. Now, we’re not really sure we’d want to rock this frizzed-out ‘fro, but Boston hairdresser Nicholas Penna Jr. gave us some tips on how to get a tamed down version of Capitol hair. To make Capitol hair more wearable, Penna recommends playing off a single element: Frizz, color or embellishment — not all three at once. 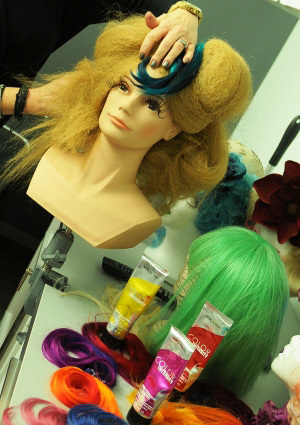 “Adding a colorful flower or bow to your hair style gives your look a fun pop of color. Use bobby pins to secure a natural flower or colorful bow to one side of your head above your ear and arrange hair around it to hide the pins,” he recommends. Also, add a fun (and temporary) pop of color by running the tip of a piece of soft chalk around a small section of hair. “The more coats you use, the brighter the color will become. It’s important to only use chalks on dry hair, as wet hair will cause chalk to stain lighter hair’s natural pigment,” he told us. Penna also suggests clipping the colored locks across the front of your head and securing them with a headband for a look straight out of the Capitol. The owner of SalonCapri also recommends keeping your look clean with subtle jewelry while rocking colored and embellished strands. “Big hair accessories and pastel hues can be overkill when paired with bold jewelry,” he advises. As for frizz, add a texture spray (Penna likes Shu Uemura’s Liquid Fabric Mineral) to dry hair and set in pin curls. “Once the curls have formed, lightly tease your hair from the crown to the back of the head using hairspray and a natural bristle brush,” he said, adding that he prefers Shu Uemura Sheer Lacquer. 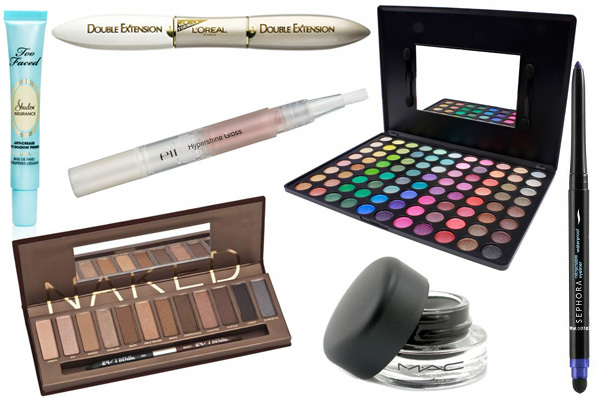 Effie and the ladies of the Capitol covet white, white skin with long false lashes and bright eyeshadow and liners. Now, we normally think that ultra-white powder is a no-no when it comes to the whole “less is more” makeup thing, but we love, love, love playing up our eyes with copious amounts of color, eyeliner and fake lashes. Like with everything else, Effie’s clothes must be over-the-top, like Lady Gaga over-the-top. It should be no surprise that the designers who created Effie’s looks in the movie are Gaga faves like Alexander McQueen, Thierry Mugler and Rodarte. Most of us can’t afford to put McQueen or Mugler in our closets, but you can create Effie-inspired outfits by focusing on big, bold prints and plenty of metal. We can totally see Effie in this Rebecca sequined mini dress by Nicholas ($350), this Leon dress from Alice by Temperley ($565) or a Zac Posen bustier gown ($2,250). As for shoes? Effie would totally rock these Camilla Skovgaard booties ($575) or Iron Fist’s heavy metal wedges ($80). Add accessories like these huge bangles from Chloe ($60) for a pop of color. How would you rock Capitol couture from The Hunger Games?